For an increasing number of kids these days playing sports doesn't end with the school year. If anything, the competitive intensity of the all-star, tournament, travel ball, showcases, and sports camps that fill up their summer vacations, means increased athletic exposures and increased risk of mild traumatic brain injury or concussion. And, because summer sports are less likely to be staffed by an athletic trainer or other health care professional with specialized expertise in recognizing and treating concussion, parents need to be especially vigilant to the signs and symptoms of concussion. Concussion, still referred to by some as a "ding" or a "bell ringer," is no joke. Concussions can have a lasting effect on cognition (e.g. functions of the brain involving thinking, concentrating, learning, and reasoning), as well as physical, and emotional effects, such as depression. (1,2,3) They are often undiagnosed and improperly managed because many health care professionals, coaches, and school/athletic personnel have not kept abreast of the most recent identification and treatment guidelines. As a result, it is especially important for parents and athletes to stay informed. With the guidance of athletic trainers, neuropsychologists, and physicians with specific expertise in concussions, high schools across the country are facing this public health menace head on. Concussion education and management programs are sprouting up in response to new national and international concussion guidelines,(4,5,6) the enactment of concussion safety laws in virtually and injury lawsuits. A concussion is any alteration in mental state or consciousness that occurs as a result of a hit or a strong force to the head. Signs of concussion may include, but are not limited to, feeling dazed or confused, dizziness, headache, nausea, fatigue, sensitivity to light or sound, visual disturbance, irritability, and attention, concentration, and memory problems. One does not need to experience loss of consciousness or amnesia in order to sustain a concussion. And one does not have to hit one's head, as a whiplash or strong rotational force can shake the delicate structures of the brain. No helmet or mouth guard can prevent concussion. Once a concussion is sustained, an athlete may be 2.5 to 5.8 times more likely to sustain another. Youth are more vulnerable than adults, experience longer recovery and may exhibit delayed symptoms which may not be fully evident until the next day or later. This makes it especially important that a youth athlete who has sustained a blow to the head during a game or practice be carefully monitored during the first 24 to 48 hours after injury. Youth up to the age of 21 or so are also susceptible to second impact syndrome, a rare but serious condition that results in swift death or catastrophic neurological injury when a youth sustains a second blow before his or her brain has fully healed from the first. It is essential that any youth suspected of sustaining a concussion not be allowed to continue in sports or athletic activity. The motto should always be: "When in doubt, sit them out." The concussed athlete should be examined by a physician to be sure that there are no serious complications, such as slow brain hemorrhaging, that might not be immediately detected. With concussion, if a CT scan is performed, it is expected to be normal, unless there is a more complicated condition. Concussed youth athletes should be placed on immediate physical and mental rest DURING THE ACUTE PERIOD. That means AVOIDANCE OF physical exercise, computer games, texting, parties, or going to the mall with friends. During the summer, it will mean absence from camp. Because of these factors and the fact that a youth athlete's brain is still developing and growing, some experts suggest that youth remain out of CONTACT RISK sports for three weeks or more after they are symptom free, especially if they have a history of prior concussions. The effectiveness of rest in the acute period, and for those with difficult or prolonged recoveries or history of previous concussions, cannot be underestimated. (7,8) How long a period of cognitive and physical rest a student-athlete will need varies. Slowly introducing mild physical activity after the acute period to help athletes stay conditioned, without increasing their symptoms, and should be guided by a licensed health care professional with expertise in sports concussion. For the athlete, an athletic trainer or physical therapist can help devise a physical exertional plan. 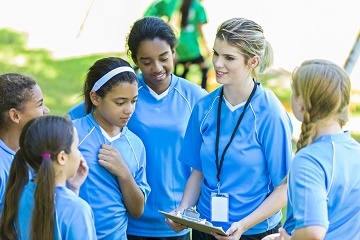 In addition, a neuropsychologist (a scientist and clinician who specializes in the assessment of brain function) can greatly assist in return to play decisions, as well as in the management of post-concussion symptoms and recommendations for academic accommodations while the youth is recovering. Once cleared from a cognitive perspective, physical exertional testing overseen by an athletic trainer or other licensed health care professional with specialized training in concussion management, should take place prior to return to play. To assist in return to play decisions, many schools have implemented baseline concussion testing programs. This type of computerized testing documents performance on memory, reaction time, processing speed, and attention tasks. If a youth sustains a concussion, he/she can be retested to help determine when scores are back to pre-concussion levels. This type of assessment, when implemented and utilized by neurocognitive specialists,(9) can increase the accuracy in decisions about recovery, as many athletes who feel physically better may still have brains that are not fully healed. It is important that both baseline and post-concussion test results be interpreted by a health care professional trained in brain and cognitive functions and in concussion assessment. It is also important to understand that this testing is just one factor among many that help determine an athlete's recovery. Importantly, we know that with proper care and management, 80 to 90% of concussions resolve quickly and fully. With youth, we just need to be patient as it can take up to one month for an uncomplicated concussion to resolve. (5,6) Reassurance, patience, and a positive attitude can pave the way to a smooth recovery. Rosemarie Scolaro Moser is the Director of the Sports Concussion Center of New Jersey and a longtime member of MomsTEAM's Team of Experts and of MomsTEAM Institute's Board of Advisors and its Head Injury Working Group. Moser, R.S., Schatz, P., Jordan, B. (2005). The prolonged effects of sports-related concussion in high school athletes. Neurosurgery. 2005;57: 300-306. Moser RS, Schatz P. Increased Symptom Reporting in Young Athletes Based on History of Previous Concussions. Dev Neuropsychol. (2017); 5:1-8. doi: 10.1080/87565641.2017.1334785. Lumba-Brown, A., Yeates, K.O., Gioia, G., Turner, M., Suskauer, S., Giza, C., Joseph, M., Broomand, C., Weissman, B., Gordon, W., Wright D.W., Moser, R. S. et al. Report from the Pediatric Mild Traumatic Brain Injury Guideline Workgroup. Centers for Disease Control and Prevention. September, 2016. P McCrory et al. Consensus Statement on Concussion in Sport - The 5th International Conference on Concussion in Sport Held in Berlin, October 2016. Br J Sports Med. 2017;51:838-847. Gavin, G.A., Anderson, V., Babl, F.E., Gioia, G., Giza, C.C., Meehan, W., Moser, R.S., et al. What is the difference in concussion management in children as compared to adults? A systematic review. Br J Sports Med. 2017;51:949-957. Moser, R. S., Glatts, C. & Schatz P. (2012). Efficacy of immediate and delayed cognitive and physical rest following sports-related concussion. J Pediatr. 2012;161(5):922-6. doi: 10.1016/j.jpeds.2012.04.012. Epub 2012 May 22. Moser, R. S., Schatz, P., Glenn, M., Kollias, K. E., & Iverson, G. L. (2014). Examining prescribed rest as treatment for adolescents who are slow to recover from concussion. Brain Injury. DOI: 10.3109/02699052.2014.964771. Moser, R.S., Schatz, P. & Lichtenstein, J. (2015). The importance of proper administration and interpretation of neuropsychological baseline and post-concussion computerized testing. Applied Neuropsychology-Child. 4 (1): 41-8. Note: This article replaces an earlier version, which was first published in May 2011.